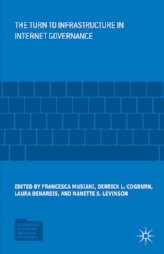 Edited by Francesca Musiani, Derrick L. Cogburn, Laura DeNardis, and Nanette S. Levinson. The Information Technology and Global Governance book series at Palgrave Macmillan edited by Faculty Director Dr. Derrick Cogburn examines the complex interrelationships between the social, political and economic processes of global governance that occur at the national, regional and international levels. These processes are influenced by the rapid and ongoing developments in information and communication technologies. At the same time, they affect numerous areas, create new opportunities and mechanisms for participation in global governance processes, and influence how governance is studied. Books in this series focus on these relationships and influences. The Information Society Series at MIT Press edited by Faculty Director Dr. Laura DeNardis and Dr. Michael Zimmer publishes original scholarship addressing the social, legal, and political implications of the Internet and new information and communication technologies. The series features empirical and scholarly research from the growing global ranks of interdisciplinary scholars in fields of inquiry such as information studies; communication and media studies; science, technology, and society; and law, technology, and culture.